The real estate industry changes all the time for various reasons, such as demographic shifts, interest rates and changing economic conditions. Overtime, it shifts from a sellers market to a buyers market and vice versa. 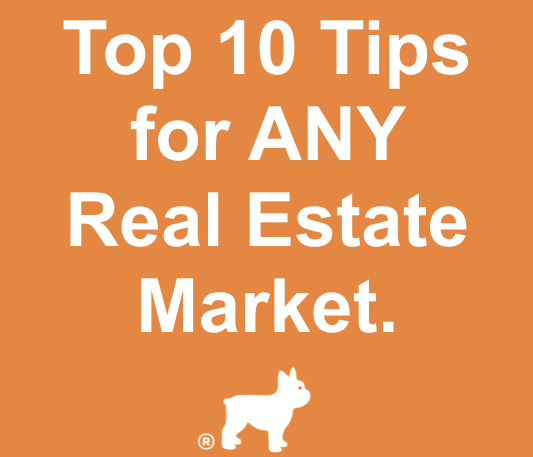 However, despite this, there are some real estate tips that remain consistent. It is never a bad time to buy. Investing in real estate is always a good idea if you plan to hold the home over time. Warren Buffet waits five years before evaluating any investment. Build equity, build wealth. On the other hand, when you sell can have a huge impact on your bottom line. Do your homework. Be aware of national trends, but more importantly, you need to understand your local market. Use multiple sources to determine best location, market value and potential future development that may effect property value. Negotiate all offers from a collaborative perspective. Negotiations are not a competition to see who wins. Ideally, both parties do. If you have facts to back up your offer price, consider them. If you are selling and receive a low offer, don't take offense, make a counter-offer based on market price. Most sales require and appraisal, so ultimately, market value will prevail. Know your fees in advance and plan accordingly. A typical first time buyer is aware that they often need a deposit and some know they will have additional fees at closing without details. In addition to the cost for the loan, which should be detailed on your Good Faith Estimate, did you know you may also needed to pay for a home inspection, termite inspection and escrow company fees? Understand the costs of buying in advance. Purchasing a home can control your expenses long term. When you rent, you are subject to price increases or the cost of moving to avoid them. With a 30 year fixed mortgage, you know your payment consistently. So, not only are you building equity, long term, you can save money over renting. Location, location, location should be your #1 factor when investing. You can change quite a bit on any property, but you cannot change the location. Find the best location in high demand areas with strong current infrastructure and potential for future growth. When you list your home, be prepared to keep it SHOW READY at all times. To sell faster and for more, the home should be move in ready. Make sure any repairs or maintenance are complete in advance. If the paint is old, give it a fresh coat. If there is something that bothers you in the home, it will likely be noticed by any potential buyers as well. If you are living in the home while it is on the market, don't leave the house without making sure you can say "yes" to any showing requests. Put together a trusted team of expert partners. There are multiple stages in a home sale and having the right team on your side makes a huge difference. In addition to a trusted real estate agent and mortgage broker, you should have an excellent home inspector, termite inspector, escrow/title office, handyman or other vendor for potential repair quotes amongst others. Don't be afraid to ask questions or ask for help. It is your investment, make it the right one. Real estate isn't a process of selection, it is a process of elimination. You need to approach your home purchase in an organized and well thought out manner that optimizes your time. Start by eliminating areas and then work your way through to individual neighborhoods. You may see a beautiful house online but when you drive the area, you realize it is not where you want to be. And, whatever you do, don't fall in love with a home until you CLOSE. Many things can happen between offer and closing and you can't be afraid to walk away and you need to remain open to stay in a strong negotiation space in case of inspection or appraisal issues. While the comparable properties can show you market value, the TRUE VALUE of the property is determined by the BUYER. Regardless of the property, a home is ultimately only worth what a qualified buyer is willing to pay for it. Your initial sales price or improvement costs are not relevant to the buyer, other than to make the offer and potential market value or above price more likely. Regardless of the market, do your research, ask questions, be prepared and have trustworthy partners to assist you. Don't be afraid to invest in real estate. After all, land is finite and it's not going anywhere. Written by Janice M. Ziesig, MBA, broker/owner of NextHome Z House Realty. NextHome Z House Realty is conveniently located in Waterford Lakes in East Orlando.